For 6 months, we have prepared our world trip to Asian and south-east American territories. But 15 days before our leaving, we were still expecting official permissions to across first borders. Last Friday, we collected our passports at the Chinese consular office. 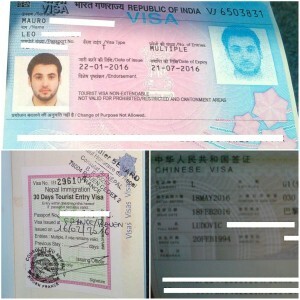 We are now allowed to travel in three Asian countries (China, India and Nepal). This is the result of two travels to Paris where authorities are located. We enjoy having achieved this step after heavy procedures. This part of our preparation costed more than 450€. March 21st, departure to New Delhi.